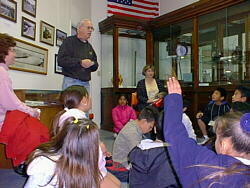 Wayne Peterson asks the 3rd grade class from Alvin Elementary School, "what might these black chunks of material be called that fuel the fire of a steam locomotive?". Coal, of course, is the correct answer, and he even had samples of the rather rare rock (for this area) to pass around. This class is just beginning an entire unit of study that will ultimately lead to an HO layout coming to their classroom. The project is called the Alvin All-Star Railroad (AASRR). 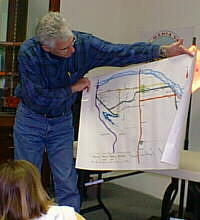 Skip Purper shares a map of the various railroads that ran in the Santa Maria Valley. There were a surprising number of different railroads of different gauges, and each was a different color on the map. The blue river, however, was not a railroad! The entire class stands in front of their hosts after presenting them with Thank You notes that included an Alvin All-Star Railroad patch. From right to left in the back: teacher Mrs. Foster; SMVRHM hosts Wayne Peterson, Dan Alves, and Skip Purper; and Mr. Foster. 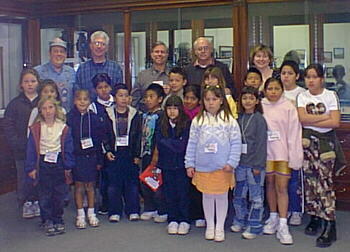 Each member of the class was wearing their AASRR name badge. One of the more popular stops on the Museum tour was the switching puzzle track. Here, Skip Purper is helping a youngster spot railroad cars at different locations around the platform. As the young engineer said, "It's not as easy as it looks!" 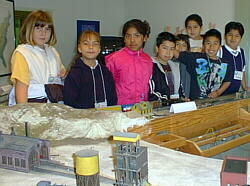 Below left, some of the children watch as the steam locomotive train travels by on the Museum's front window layout. 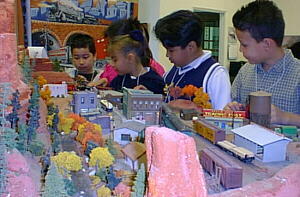 At right are children watching the train on Skip's layout which is based on the Sedona, Arizona area.